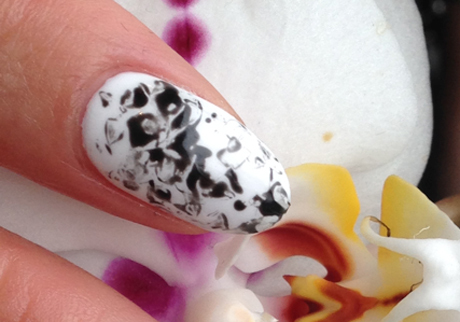 Follow these simple steps for a luxurious marbled nail look. Step One: Paint nails with white and let dry completely. Step Two: Use a scrunched up piece of foil and dab into black polish. Then blot onto nail creating an abstract pattern. Step Three: Seal in the design with a clear top coat.